Here are 10 tips to help guide your college visits. 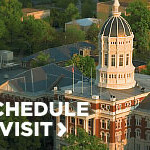 Visit colleges during spring break. Most colleges are still in session as their spring breaks are usually earlier than ours. High school juniors and families can see ongoing, authentic campus life. Try to visit a variety of schools on your child’s list. Even if timing or money is an issue, you can visit campuses locally to help expose your child to different forms of campus life. Many kids are very visual and need to see a campus in real life. Show them a variety of campuses so they can see what it means to be at a large urban campus versus a small suburban one. Please just don’t visit colleges that are unlikely or true stretch colleges. Try to build in visits to 50-50 or likely schools as well. Develop a checklist. Students should go to college to look for certain core factors, such as availability of particular majors, percentage of students who move off campus after sophomore year, the availability of activities on weekends, etc. Plan your trip to make sure students can witness or even participate in these core factors. Book at least a tour, information session, and interview (if offered). Booking campus visits is easier than ever: it’s all online. Sign up for at least an official tour and information session. Visits ideally last a minimum of two to three hours. Class visits are also available at many campuses. Check for special spring programming. Many colleges also host open houses, special information sessions, and extra campus tours during this very busy time of year. Visit the college’s admissions website to see what it offers. Visit with anyone you know. If you know any adults on campus, try to meet with them, especially professors, coaches, and admissions officials. If you know any current students, try to meet them for coffee or lunch or arrange an informal overnight visit. Spending the night in a dorm and on campus can really show a junior what that campus is like. Pay close attention to what campus students talk about. Really try to speak with current students. Get a sense of what their priorities are at each college. It’s always impressive to see students who are genuinely excited about certain classes, or professors, or an upcoming internship or semester abroad. Yes, college students all want to have fun, but you’ll be especially impressed by a college whose students clearly know the main reason they are there—getting an education! Ask probing questions. Tours often highlight a college’s strengths. Make sure you probe students to also determine some of the college’s weaknesses. Every college has some and you want to make sure they’re ‘acceptable’ weaknesses for you. Do they have programs for your interests-athletic, social, extracurricular, academic, and cultural? What do students do on weekends? Do they have programs to support diverse students? Make sure to let the visiting student gets to go off on his or her on for a bit. Juniors may want to go off with a friend or visit some parts of campus on his own. That is fine. Some joint and separate experiences on campus are just fine. Take some brief notes or pictures about each visit, including things you liked and things you didn’t particularly like. Take business cards from any adult you meet and write a note on the back about something this adult said during your visit about the college. Take pictures of key parts of the campus that impressed you. These notes and pictures will be helpful during application and acceptance time next year. Remember to write thank you emails or cards to anyone key you met on your trip within 72 hours of your return home. Use these visits to refine and expand the junior’s college list. Through these visits, the juniors may find a kind of college they like, and you will need to research additional schools. Fall visits are also great and a great chance to visit some top schools or even new schools. Many parents and counselors think students can just visit colleges after they get accepted. That is true for many large public universities as they don’t track demonstrated interest. However, campus visits are important to help students visualize their future options. They need an opportunity to connect with college campuses, and springtime college visits will help them decide on their ultimate college lists as well as how to shape their upcoming year. Many college track the visits, and these visits are a great beginning as students may make key contacts. Moreover, this process helps families experience college together. If families can’t go, students can send pictures and notes back home. Please support this vital component of the college application process.